Super Turbo Secret Santa Thing! These two wonderful items arrived today thanks to Enginerrrrrrrrr! A 1/43 Porsche 935 (Minichamps!!!) and a super nice coffee table book featuring some awesome photography of historic and contemporary Le Mans racers. 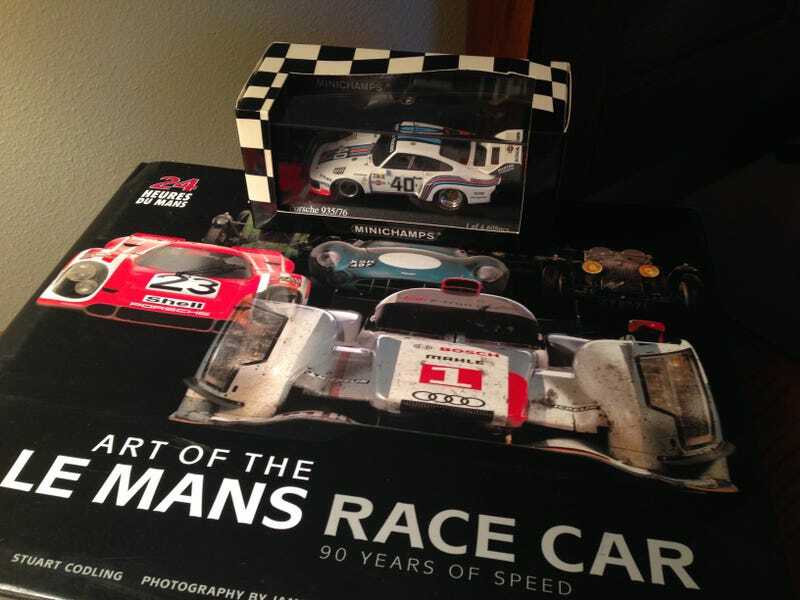 1/43 happens to be my favorite scale, I have a small coffee table book collection, I’m a big Porsche nut, and the 24 hours of Le Mans is my absolute favorite race. This box hits all the right notes. Thanks Enginerrrrrrrrr! It also included a hand-written note, which is par for the course in this awesome community. Unfortunately, no time for anything but cell phone pics tonight. I will have to get this thing off its plinth and do it some justice with my camera soon. I don’t want to show too much of the copyrighted photography inside the book, but I couldn’t resist playing a little matching real quick. So I leave you guys with this picture. Happy hunting and merry Christmas!